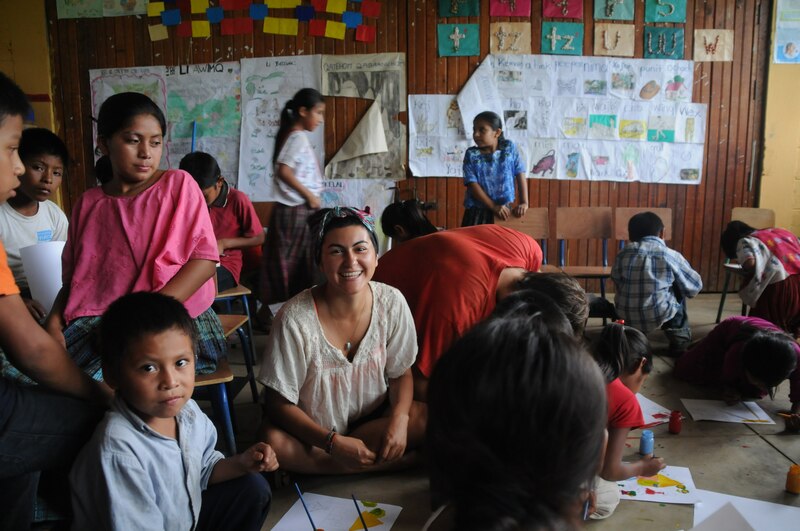 After the Fair Trade Early Summer group had left their hearts on the cancha, the tiny aldea of Tzibal (‘Zee-ball’) was more than eager to host another hard-working group of gringos. Having just come off of the trek we were more than accustomed to sore muscles and long days, exactly what we were to experience during our 7 days in Tzibal. In true Q’echi fashion, the Guatemalan community greeted us with open arms, this time trekking 45 minutes into the nearby “town” of Campur to meet us upon arrival. After a round of hugs and brief intros, we all piled into the back of a farm truck to complete our voyage into the hamlet we had come to stay and work in. Our week’s work cut out for us! The week flew. 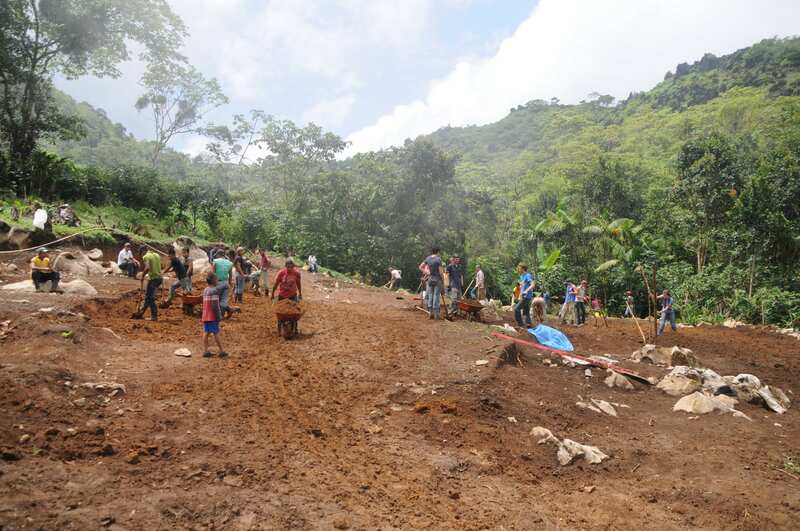 This time around, rather than working in the community garden as we did with our Fair Trade peeps, we worked on the actual bulk of the cancha. 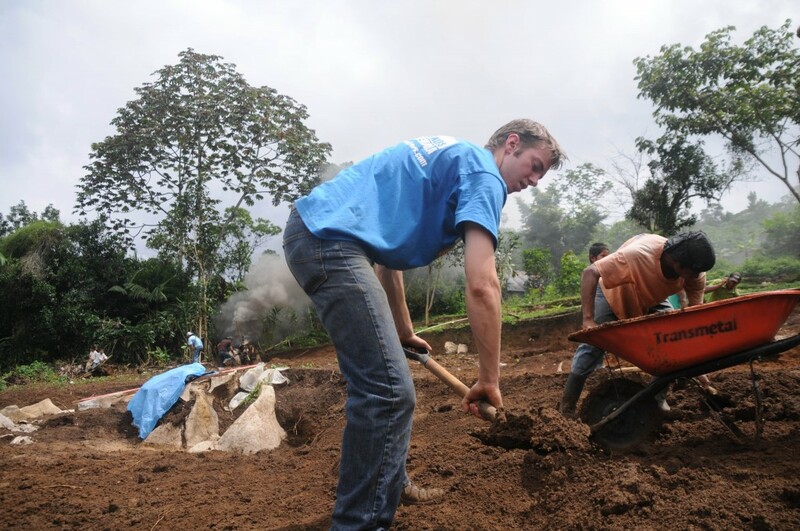 Our aim was to finish leveling the entire land mass in 5 work days with the goal of playing a soccer tournament with the Guatemalan community on the day of our departure. We worked hard, but our progress was stalled for several reasons. Firstly, because of the current lack of work in Tzibal, many of the men have been forced to temporarily seek work elsewhere. Many were working in Petén (a northern province), in the capital city, or in Mexico. Martin fartin’ smoke, no joke. In addition to our slighted manpower, Mother Nature dealt us a completely unlucky hand as well. 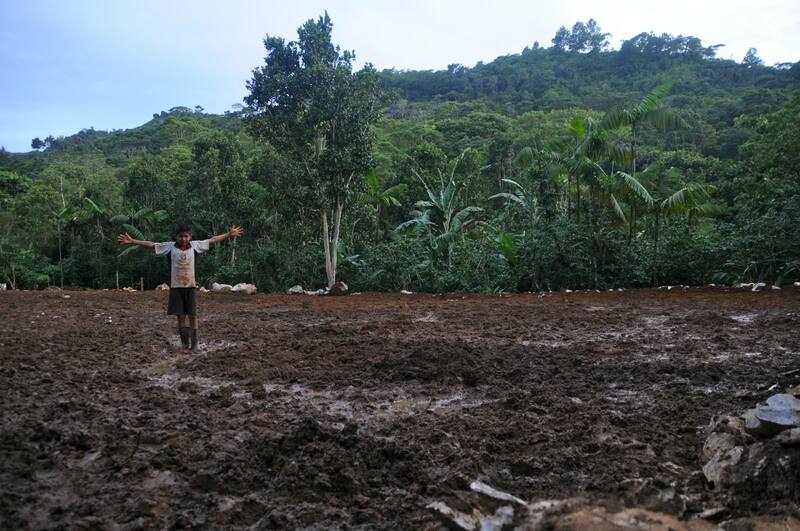 As the week wore on, the amount of rainfall increased exponentially, turning the cancha into an absolute mudpit. By day 5, we were essentially working on a precarious sinkhole. A third unruly factor was the continual upheaval of rocks- no, boulders- that necessitated removal in order to continue leveling. 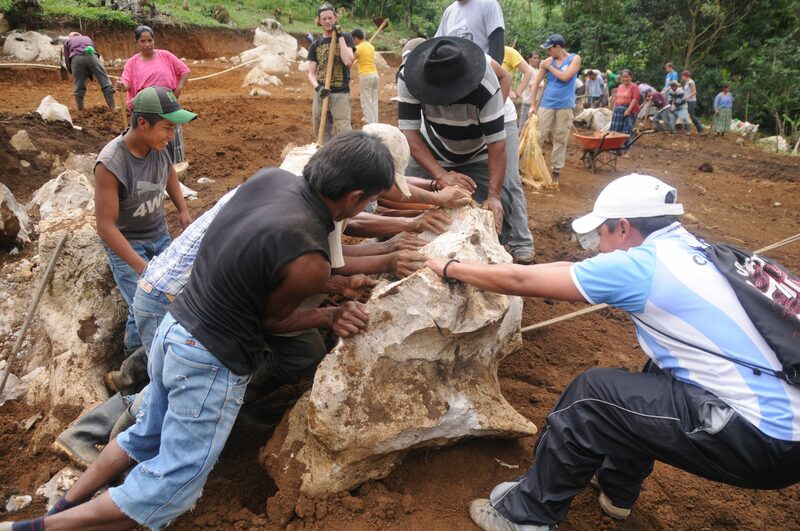 Almost everyday we’d hit a new patch of piedras, most so big that they needed to be broken down into smaller pieces for removal. To crack these giants, the crafty community members built huge fires on top of the rocks with the hope that intense heat would crack the stones deep into their core. Their method worked for the most part, and after the rocks broke we were able to holster the “smaller” pieces and drag them out of the ditch, tug-of-war style. Despite several minor obstacles- manpower, weather, and rocks- the OG crew, together with the community, thoroughly enjoyed the week’s work and made immense progress. To lighten up workdays, we’d create mini competitions like rock-rolling races or dirt-dragging relays. Of course, every workday was supplemented with local snacks and beverages prepared by the community women. Not only did they provide us with refreshments, they also spent their mornings working alongside us and the community men. We still can’t figure out how they managed to do it all! The kids of Tzibal are ready to play! A week in Tzibal wouldn’t be complete without the relentless hospitality and warm welcome of the entire community. Our hard week of work was supplemented by plenty of tortilla making, a local hike, a birthday party celebration, a church service in our honor, and of course, a gran despedida. In an attempt to show our gratitude, we also organized an afternoon of art projects with the kids as well as a pre-despedida barbecue, North American style. Elise shares her painting expertise with the children. Perhaps the greatest event of the week, however, was the round robin fútbol tourney on our day of departure. 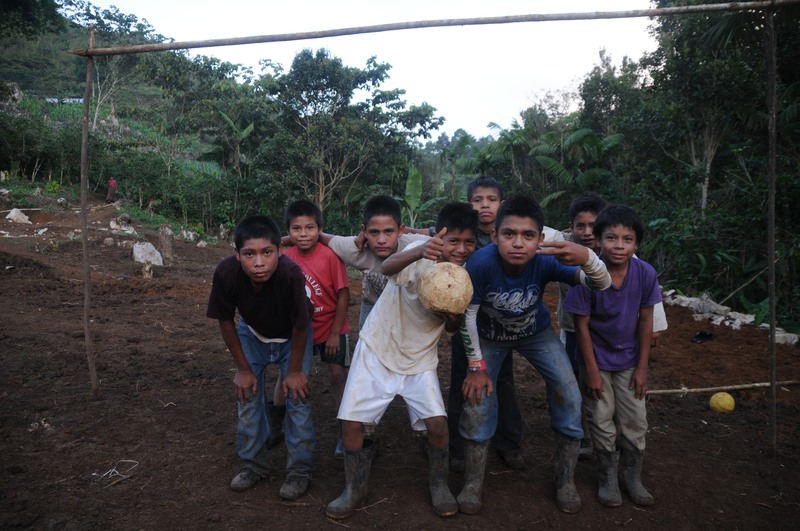 Sadly, due to the uncharacteristic bounty of rain, we were unable to play on the cancha we had been working so hard on. Instead, we all trekked the 45 minutes into Campur to play on their indoor cancha. Team OG Guatemala took on three men’s teams, and Team Lady OG Guatemala took on the community women, traje and all. Although each game was fantastic in its own right, the most entertaining was definitely our ladies versus theirs. Whether the women were hiding the ball underneath their long skirts or throwing a couple elbows here and there, the game was nothing short of fair, and they put up quite the fight, making their community, and particularly their sons and husbands, proud.